I’ve spent another long day in Lancaster today, mostly researching the book, but also having meetings about the concert, which is coming along nicely. It’s a few weeks away from being ‘official’ and quite a long way off having received funding, but it’s all happening and everyone is on board and agreeing with everything. I can’t wait to be able to tell you that tickets are on sale and a publisher has been found. Neither of those exist at the moment! My hours in the archive were spent (for no particular reason) in the first half of the 1950’s and turned up loads of really interesting stuff for the book. 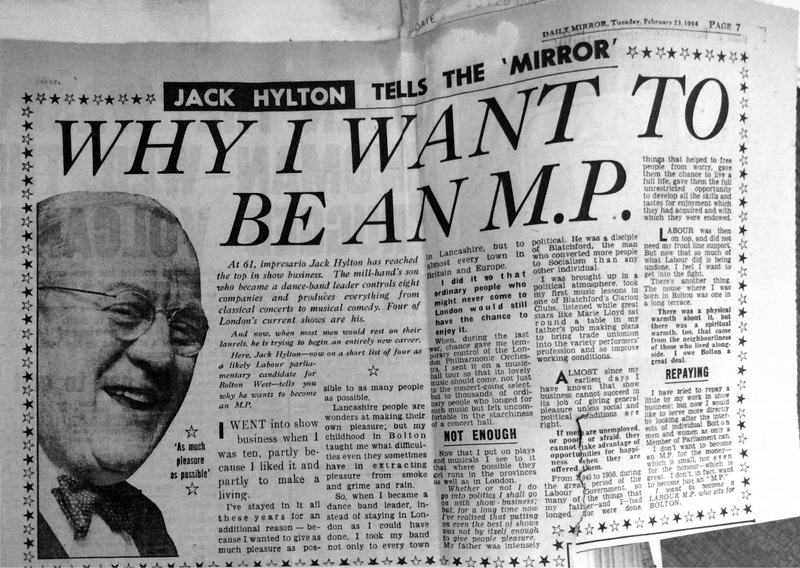 It’s fairly well known that for a time Hylton was thinking of standing as a Labour MP for Bolton, but this article gives this in Hylton’s own words. It’s fascinating! It’s also only a few pages later in the press cuttings book that reports filter through that he’s not going to stand anymore because he’s too busy with all his shows! Plenty of other stuff is being held back of course – no point me telling you everything about Hylton – I want you to buy the book! Click on the image to see a larger version.